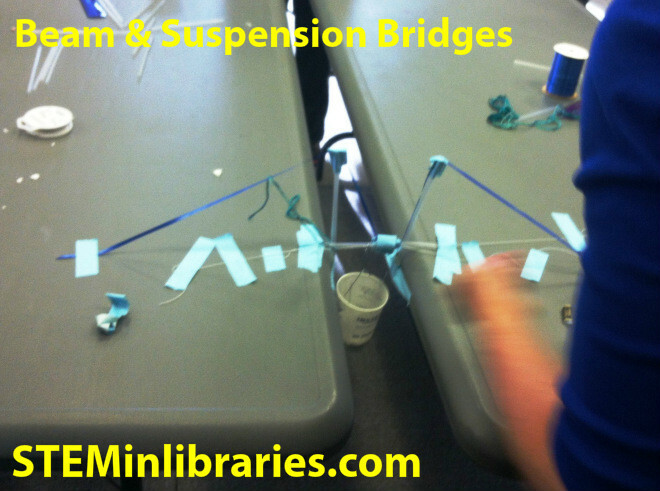 Learn the difference between beam and suspension bridges, then build and test your own for strength in small groups. -Make the paper cup weight holder, as shown on Science Buddies. Our favorite source on the forces at work in bridges was this page on Tension and Compression on How Stuff Works. PBS’s Building Big also has an excellent interactive graphic that you can use to demonstrate these forces. To show different types of bridges, we used pages 3 and 4 of NOVA’s Build a Bridge website. We showed them the different types of bridges on page 3, pointing out their differences, strengths, and weaknesses. Then, we walked through the activity on page 4 as a group. Other nice sources of bridge types include PGHbridges.com, How Stuff Works, and PBS Building Big’s Bridge Basics. How Stuff Works’ “10 Reasons Why Bridges Collapse” is a good resource for talking about structural failure in bridges. After you talk about this briefly, show this (truly shocking and scary!) video: Mysteries at the Museum: Tacoma Narrows Bridge. 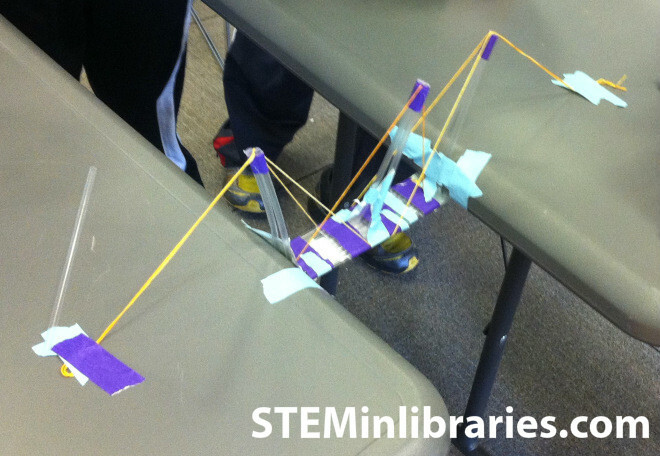 We used this Beam & Suspension Bridge project from Science Buddies. For excellent instructions, please visit their linked website. Teams were allowed to use an unlimited number of straws for their designs. We gave tips on how to attach materials to each other as well as the tables, making sure that they knew how we would be testing the bridges for strength. We anchored the bridges between two tables (which is a bit of a problem, as the tables were easily moved). 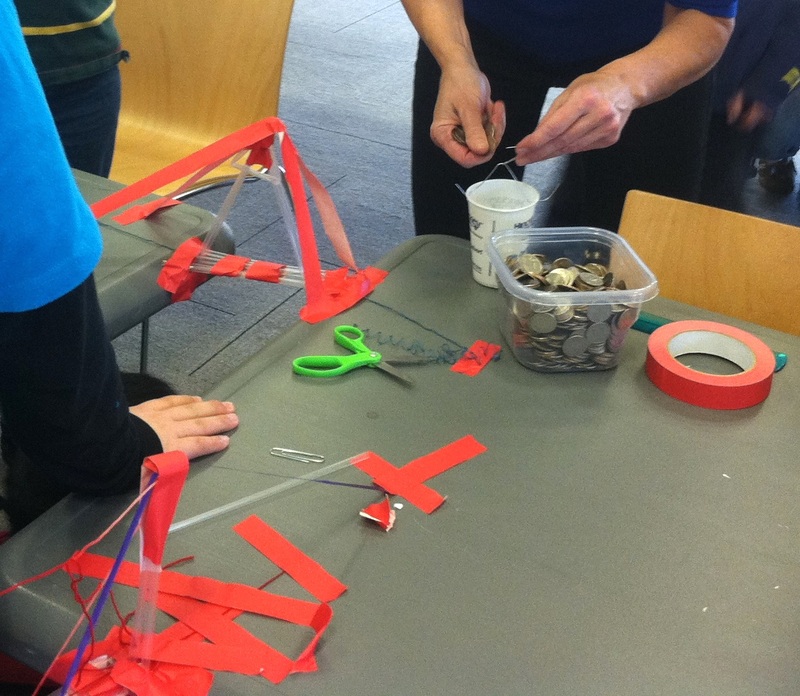 If it’s looking like your group won’t have enough time to finish two build & test periods (or if you don’t want to do two rounds), you could simply give them 45 minutes of building time to make a beam or suspension bridge, followed by 20 minutes of testing time. Be sure to allow sufficient time for testing. Our kids really enjoyed the suspense of counting out each quarter as it was dropped into the cup–every single time! Using something slippery and thin like string was tricky for 4th-6th graders. We wanted to use yarn, but were worried that it might have too much give. In the future, we will experiment with yarn in advance of the program to see if it’s a better alternative. For younger children, we really like the idea of simple paper bridges, as found on Stay at Home Educator, Kids Activities Blog, ACS.org, and PrimaryScience.ie. We also thought that the ideas on this ALSC Blog post would be great for younger school aged children. For older children, there really are no limits to what you could do given a longer time limit…more complicated straw bridge designs, newspaper bridges, even Spaghetti Bridges!